Oh, I know how this game is played. Presidential elections are determined by the economy and little else. Whoever wins either party's nomination has a decent shot of actually winning the presidency. It doesn't matter who that person is or what they're like. That's why you can't cheer for people like Sarah Palin to get the nomination: because if they did, you might actually end up with a President Palin. But I just can't help myself this time. 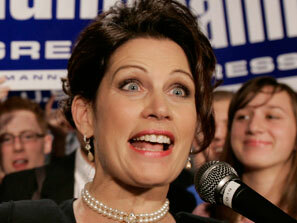 Bachmann 2012, baby. Michelle Bachmann = Palin Ultra Deluxe. She's like if you took the snow and the hick out of Sarah Palin, and then filled her up with crazy Ron-Paul-Alex-Jokes-Joseph-McCarthy ideas about how Islamomarxists inside our own government are out to bankrupt America for the glory of the New World Order, and then put the snow and the hick back in, at which point she is so full to bursting that she literally is unable to close her eyes like a normal human and has no choice to gaze out at us in total buggy insanity. We have to recognize this for what it is: an historic opportunity. First and foremost, an opportunity for the single most entertaining political campaign ever, anywhere. Potential highlights: She gives her acceptance speech while packing heat. She carefully explains to cameras how Obama embedded Marxist symbols in the ten-dollar bill. Her campaign ads feature her actually patrolling the Arizona border in a dune buggy, cuffing Mexican children and hauling them to Joe Arpaio's office. During a televised debate, she accuses Obama of literally selling state secrets to China. The possibilities are essentially endless. Let's face it, all that political science jazz only goes so far. Economy shenonomy -- if this country votes in President Bachmann, it's time to upgrade and move to Vancouver. Or Tripoli, for that matter. Oh sure, ideally, she'd flame out spectacularly, and drag down half the Republican ballot with her. But if she didn't? I'd mourn the dearly departed United States, I really would... but if you're a citizen of the world's largest practical joke, wouldn't you rather know about it sooner rather than later? This is fated. This is what it's all been building to. Palin? O'Donnell? Trial runs. The third time's the charm. Michelle, destiny is calling. History is watching. Your country needs you. Godspeed, you complete and utter wackjob.